Ephesus was an ancient Greek city. It was one of the twelve cities of the Ionian League during the Classical Greek era. The city was famed for the Temple of Artemis, one of the Seven Wonders of the Ancient World. Today's archaeological site lies 3 kilometers southwest of the district of İzmir Province, Turkey. The ruins of Ephesus are a favorite international and local tourist attraction. 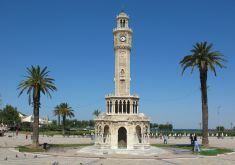 Visit Agora (The ancient market) and the castle of Alexander the Great, finally The Great Archaeological Museums of Izmir.